A commercial building is defined by Sussex County Building Code as being a structure used by the public or private associations for goods and/or services received such as retail & wholesale, houses of worship, consumption of food, entertainment, services for personal and medical needs & offices. This also includes Apartments Buildings. 1. What wind speed are commercial buildings required to build to in Sussex County? Wind speed designs can be from 105 mph to 140 mph, depending on location and the risk category for the use of the proposed structure. 2. Do I need a Com Check to submit plans for my commercial building? Yes, all new construction must be designed and constructed to the International Energy Conservation Code. 3. What direction do egress doors need to swing? Typically exit doors need to swing in the same direction of travel where the serving room or area contains an occupancy load of 50 or more persons. 4. What is the frostline for commercial buildings? 5. What is the slope for a ramp? Ramps used as part of a means of egress shall have a running slope not steeper than one unit vertical in 12 units horizontal (8-percent slope). 6. 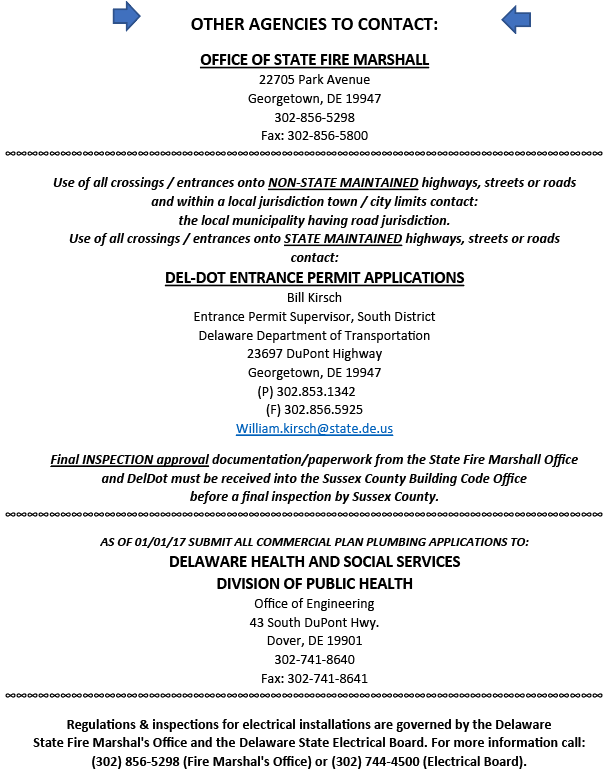 Can I make changes to a sealed set of plans already approved by Sussex County? No, you have to have the Architect/Engineering redraw the changes & bring those new plans to our Commercial Plan Reviewer. Plan review and inspections fees are calculated by multiplying the total construction value of the entire building, times .005.